Throughout the many years, I have used many different acne skin products to help get rid of my acne. Here I am, 29 and still getting acne. It can definitely be frustrating, especially when you think you've found a product that may work and it turns out they don't work that well on your skin. 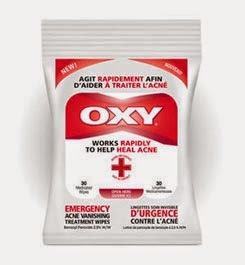 I was sent OXY Emergency Acne Vanishing Treatment Wipes to try and I have to be honest with you, these seem to be the best wipes I've used so far to help with my acne. These wipes are the only medicated wipes in Canada that are clinically proven to kill acne bacteria on contact and quickly help heal acne blemishes. They unclog pores quickly removing dirt, oil and dead skin letting the oxygen through to help your skin breathe and keep bacteria away. The alcohol free formula on the wipes prevents over-drying while the oil free moisturizers help relieve redness to your skin due to dryness. The packaging is the first thing I love. The fact that I can just throw these in my purse and take them with me to use just about any where when I need them is definitely a plus. The size comes in handy, especially being a mom on the go. When I opened the flap only one wipe came out which is very useful as you don't have to worry about the wipe drying out or wasting more than one wipe. The wipes have a slightly rough texture and are surprisingly small; each one is only about a quarter of the size of a piece of facial tissue. I've been using them once in the morning and once in the evening and I am very happy that I have found a product that vanishes early signs of pimples and horrible acne. After washing my face in the shower as I do on a regular basis I just used the wipe on my face, paying special attention to my forehead and chin since I’m most prone to breakouts in these areas. Afterwards my skin feels refreshed and actually clean like there is no built up of dirt. I would definitely recommend these wipes for any of you out there that are like me with bad acne. Not only do they work really well, but they are very affordable retailing for $7.99. 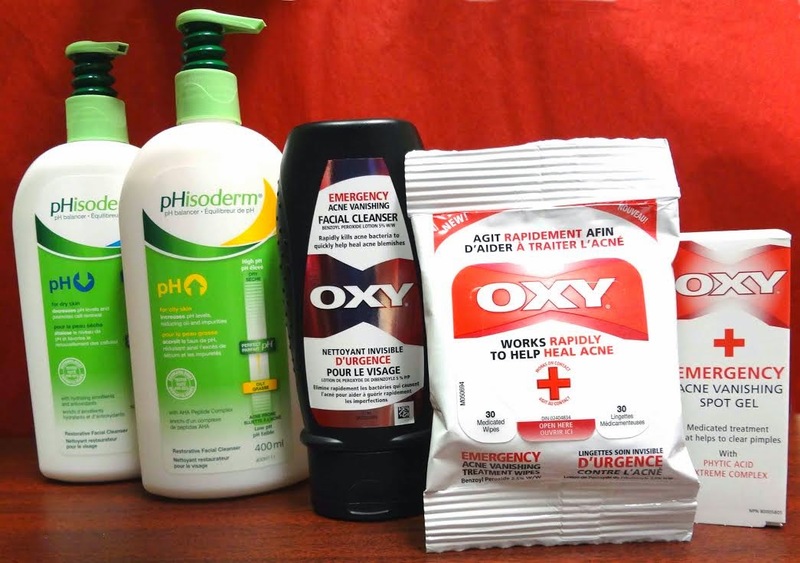 To find out about more Oxy products be sure to check them at on their website. Disclosure: All opinions are my own. I received the above mentioned prize pack at no cost for the purpose of this review. No other compensation was received.